Improve your developers' skill set and help them write better code, faster, with a training course or workshop delivered at your offices by our Technical Director Anthony Williams. You can book our popular two-day multithreading and concurrency workshop on Concurrent Thinking in C++. Alternatively, we can design custom workshops to cover your specific requirements. We offer advice and code reviews via phone and email, as well as site visits. Find out more, or contact us to see how we can help. We also offer custom software development. Our ethos for software development focuses on using collaboration and feedback to produce reliable software to your specifications. just::thread Pro provides extensions to the C++ Standard Library to make it easier to write error-free multithreaded code. It is available to purchase for Microsoft Windows and Linux. 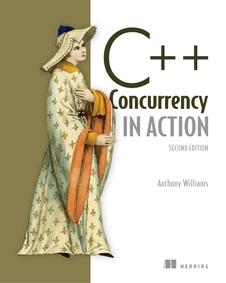 Anthony Williams has been speaking regularly at conferences for over 10 years, and has also delivered the Concurrent Thinking in C++ workshop at both NDC Oslo and CppCon. A full list of his conference presentations is available here, along with slides and some videos. In 2019, Anthony is currently booked to present at ACCU 2019 (UK), The Developers 2019 (Romania), and CppCon 2019 (USA). Our Technical Director, Anthony Williams, maintains a blog, where he writes about C++, multithreading and software development in general. This includes his popular series on Multithreading in C++0x. To subscribe via email, enter your name and email address in the box on the left and click "Subscribe me". Anthony has also written some free C++ libraries available from his github page and bitbucket page. Links to Anthony's other publications, such as his numerous magazine articles, presentations and C++ Standards committee papers, as well as his book, are available from our publications page.